Fans couldn't be more excited for the on-screen lovers! 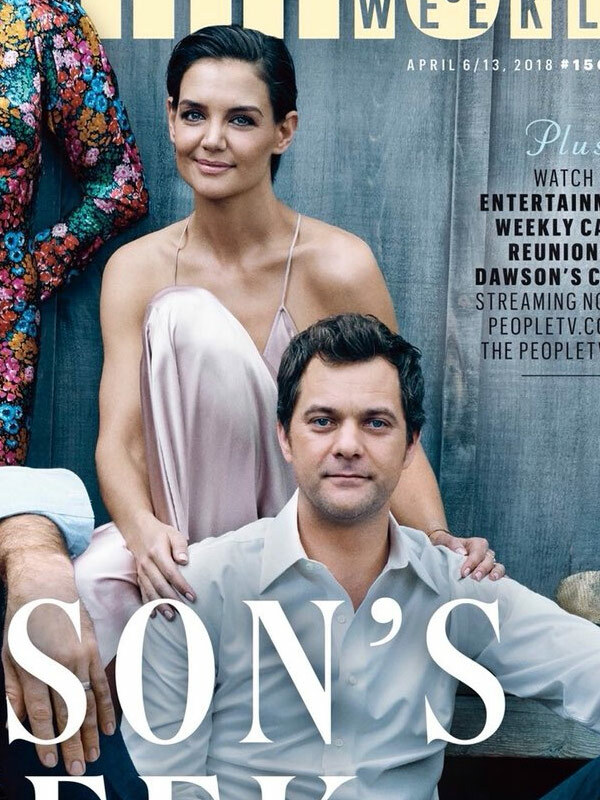 Fifteen years after Dawson's Creek ended, Joey and Pacey remain one of television's all-time favourite couples. So fans went wild when the actors who portrayed the pair, Katie Holmes and Joshua Jackson, reunited alongside the rest of the cast to celebrate the 20th anniversary of the hit show's premiere for Entertainment Weekly magazine late last month. Woman's Day can reveal sparks flew between Katie and Joshua behind the scenes, with those close to the actors revealing they're finally ready to give their love another shot. "There's always been a connection between Katie and Josh, and it's an open secret they really dated for a while. That's why they made such a great pairing on the show," says an insider. "That hasn't gone away. It was so much fun for all the cast to get together again, and it brought back a lot of happy memories. It seems like it also reminded them of some old feelings. When they were on set for the cover shoot, the chemistry between Katie and Josh was insane." They're still so comfortable around one another! Watch a very cute moment in the tweet below. The reunion comes amid claims the 39-year-old actress' relationship with Jamie Foxx is on the rocks. Meanwhile, Joshua, also 39, has been single since ending his high-profile romance with Diane Kruger in 2016. "Katie's relationship has been plagued with rumours that Jamie has been flirting with other women and getting close to his baby mama [Kristin Grannis] again," the insider reveals. "Josh is single now and he's enjoyed playing the field for a while. He's ready to find someone he could have a real relationship and settle down with. Josh broke up with long-time love Diane Kruger in 2016. "When Katie and Josh dated in the past, they were so young and the timing wasn't right. That didn't change the way they felt about each other, though. "There's always been something there and now it seems like they might actually give this a shot." Katie and Joshua were an item during the early days of Dawson's Creek, when they were both teenagers. At 19, she described her co-star as her "first love" in an interview with Rolling Stone. "I'm just going to say that I met somebody last year. I fell in love, I had my first love and it was something so incredible and indescribable," she said at the time. "He was my first love!" Then after Katie divorced Tom Cruise in 2012, she called Joshua and they reconnected. "They've stayed in touch ever since," adds our insider." It seems like Josh is the one Katie always goes back to, especially when she's going through a rocky patch in her love-life. They've been good friends to each other over the years and genuinely care about each other." "So much has happened since they were on Dawson's Creek, and it goes without saying they're not the same people they were back then. But having that experience together really bonded them and there's no doubt they'll always be close." Watch Josh talk about reconnecting with Katie in the video below! In fact, sources say they've been spending a lot of time together recently – and he's even getting to know her 11-year-old daughter Suri. "Josh is a bigger part of Katie's life these days than most people realise," reveals the insider. "He's met Suri and they were adorable playing together. Now, the word is Katie and Josh would both like to see where their friendship could go romantically. ""A lot of people would really like to see these two get together. The fact Josh was the first guy Katie ever loved means she'll always carry a torch for him. It's the same for Josh – Katie is the one that got away." Adding, "But now it seems like they could finally get their chance to make this work." Want the latest celebrity gossip now - subscribe to the Woman's Day podcast!